I don't know if you get over to the City of Sierra Madre Facebook page much. I hadn't been there in a while, but somebody kindly pointed the following item out to me. Perhaps this is all a consequence of the City Council's refusal last year to spend $50,000 for a Public Safety Master Plan consultant? Well, OK. Perhaps not. So apparently Sierra Madre is in the throes of yet another of its periodic crime waves, and as is usually the case the SMPD wants you to help them do something about it. Not only that, but 32 Sierra Madre Facebook users "Like" it. I'm scratching my head over that one. Sierra Madre has experienced an increase in residential and vehicle burglary activity. From December 9th 2014 to today, there have been OVER 20 reported burglary incidents. Please remove any items of importance and significant value from your vehicle before leaving your vehicle. Items have been stolen from BOTH locked and unlocked vehicles. In some cases the suspects have smashed vehicle windows to gain access to items left on the vehicle's seats. If possible, hide or remove garage door openers typically left in vehicles. For residences, always lock and secure all windows and doors. If possible only keep windows and door unlocked that are in your immediate area while you are home. While away from home, try to place money, jewelry, and small high value items in a safe. If you have a camera security system please make sure to activate it prior to leaving. In numerous cases the residence had a camera security system but it was either off, not connected, or wasn't working and they never got to fixing it. All incidents are happening during various times of the day. Please be very vigilant and REPORT anything that may seem suspicious to you. Do not allow yourself to think it may be nothing or not a big deal, call Sierra Madre Police and we will determine the nature of the incident. If you SEE something, SAY something! As a community there is a need to band together in vigilance and reporting anything to Sierra Madre Police. I don't know about you, but I sense something of a disconnect here. I am going to forward this report to Movoto and see if I can't get them to enlighten us a little bit about this. It doesn't make any sense. Pasadena's City Council Handed Out Administrative Employee Raises AFTER Learning About $6.4 Million Dollars In Embezzlement - No, Really! Pasadena city manager gave pay raises to department heads amid embezzlement probe - One month after an audit criticized the management of a multi-million dollar utility fund, which allegedly had been swindled for $6.4 million, City Manager Michael Beck gave pay raises to department heads, including the two managers who oversaw the fund and its accounting, city documents show. At Beck’s recommendation, the City Council approved the raises, and also renegotiated his contract, allowing Beck to turn unused vacation hours into a $64,000 “deferred compensation” package, according to the documents obtained by the Star-News. The moves occurred in November and December. City officials learned in May of an alleged $6.4 million embezzlement from its Underground Utility Program. On Nov. 11, Beck received the results of the audit that showed there had been lackadaisical oversight of the obscure fund intended to reimburse residents for the cost of placing their utilities underground. At least one city council member said he now has questions for Beck. “Given what we know now about what occurred, I do question why some department heads were provided with raises,” said City Councilman Victor Gordo, who, along with the rest of the council and Mayor Bill Bogaard, approved the pay increases as part of a routine vote on various items of city business. The City Council, on Dec. 8, authorized Beck to give a 1 percent pay increase to 12 executive management employees, including Public Works Director Siobhan Foster and Finance Director Andy Green. In May, when the city uncovered the suspected embezzlement scheme, officials went to the district attorney seeking a criminal probe. Additionally, the city began its own administrative investigation and hired KPMG to conduct a forensic audit of the fund. The audit was completed Nov. 11 and publicly released last week. I'm going to take all of this as proof that Monday's "Special Meeting" at Pasadena City Hall was more of a public relations stunt than anything else. Something designed to placate residents and preserve the status quo rather than any kind of meaningful attempt to come to grips with that city's extraordinarily serious problems. I mean, the Pasadena City Council gave raises to city administrators after (AFTER!) having learned that these people had been unable to detect $6.4 million dollars in embezzlement by a City Hall employee over an 11 year period? Madness is just about the only word I can use here to describe it. Mayor Bill Bogaard is not a young person. He was one at one time, but those days are gone. As my Dad always says; when referring to the harder parts of our golden years and he always spells it out too "A, G, E" he says. It seems to cover everything, from the trips to the ER, his pace maker, the creaking in his bones, and now the onset of alzheimer's. He puts on a brave face for my mother, but it's hard on everybody. I gave him a RC plane for Christmas, I found out after as I saw tear in his eye, my mother whispered in my ear "he's always wanted one". I must make it out there this weekend to fly it with him. My Dad was the V.P. of AAA and was the primary deign engineer for the 15 freeway. There is a time for work and leading people, and there is a time when you should just go fly a plane. All good for you and your dad. Those people in Pasadena got raises because their feelings were hurt by the embezzler. The Directors in Pasadena got raises for their loyalty to Michael Beck. Mr. Beck settled them in shortly after he ascended to City Manager, unseating former long term employees. Damn right they formed a solid line to protect the head of the snake. Their bread and butter depend on their silence. Talk about "I put you in; I can take you out." Michael Beck is a SNAKE!!! 9:28 - I hear if Beck takes someone out it is usually Burger King. 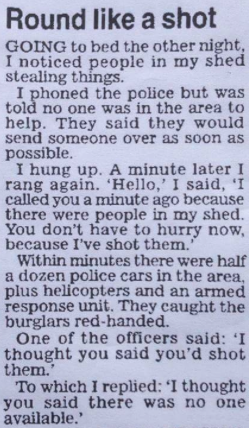 That is why the police need a raise. The burglars have made them feel bad about themselves. Is Kersting Court really as green as it appears in that photo? You'd think it would be kind of reddish as the whole thing is a look through rose colored glasses. There was magic in the air that day. Somebody's camera was on Paxil. Has anyone noticed that the police blotter in the Mountain View never seems to have a full accounting of police activity? When your read the Sierra Madre news out of Monrovia, they always have more on their police blotter for Sierra Madre. The police blotter is full and complete. What is reported is a sort of "Readers' Digested" The person whom Ms. Henderson sends to the SMPD to read and excerpt malfeasance uses editorial license on what to report. Maybe a Tattler researcher should visit the department and report the full and complete blotter as a feature for the weekend... could be very popular. The current Mtn Views "News" strategy seems to be all happy news. Everything is good, so don;t believe anything you hear otherwise. A steady diet of nothing. A "Tattler researcher" Is that like the Fox News Police? No. It is someone that digs up unknown or inconvenient facts about things that you might wish didn't see the light of day. That you can only deal with this by dredging up ridiculous and inaccurately applied worn out cliches speaks volumes about the nitwittery of your existence. 9:46 is simply one of those oblivious people who never actually thinks. 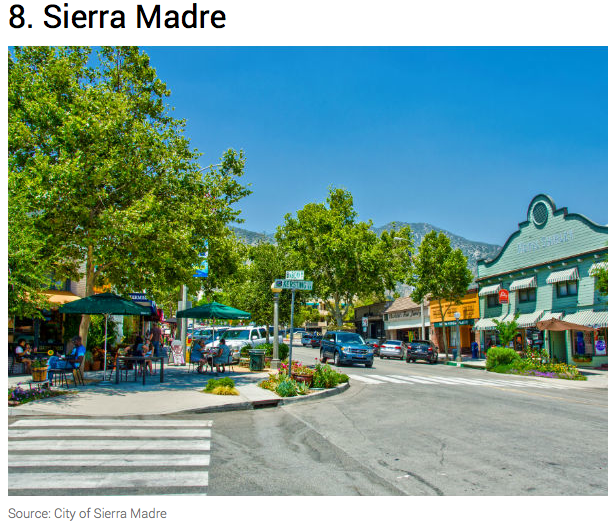 But giving 9:46 a chance to figure it out, the preservation movement in Sierra Madre is comprised of people from every imaginable point on the political spectrum. Preserve Sierra Madre meetings are great. Nobody brings up national politics. 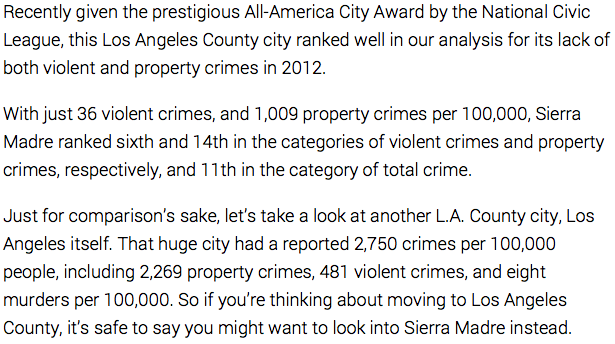 Makes sense, it's Preserve Sierra Madre. How many people do ya think live in Sierra Madre that have the outlook as 9:46 AM? If there are, no wonder there is a lack of participation in important activities in tone. Maybe he's one of the burglars and he's scared. Hunh. The Pasadena Weekly has once again pulled the link to yesterday's Tattler post from the comments section of this week's Andre' Coleman article on the Wooten embezzlement scandal.That's OK. Out of the 5,400 or so hits we've received since that article went up the 11 we got from P'Weekly readers were by far the best. The terrorists in France are dead. Thank God. It is humorous that PW had an entire week to report the story and absolutely broke no new ground. The Weekly is part of Pasadena's establishment and hates to rock the boat. Your link got pulled because you are taking people to a site where they will get more truth about the case then PW or Pasadena Now or the PSN conglomerate are willing to disclose. Andre is a paid scribe, his handlers work at City Hall. He writes only what William Boyer and Michael Beck tell him to write. I hear they have a sign on the wall that asks: "What would Peter Dreier do?" Still waiting for MICHAEL BECK TO BE FIRED!!!!!! You kidding? The Pee Dee City Council gave Becky 60 days to write up what will be called a report. 60 days because they all know that in the short attention span theater that is Pasadena people will have forgotten all about it by then. The establishment loves Beck. He holds the hoi polloi at bay. This is where the media needs to expose Beck and all these crooks. If the people in Bell can demand justice, so can Pasadena residents. This is much bigger than Wooten and his scammer pals. I get it, let's fire Beck and ignore the fact that the Council members responsible for oversight, ala Terry Tornek, didn't do JACK SQUAT for 6 years! Do I have that right? Jacque Robinson didn't do JACK SQuat, either. And both she and Tornek say they're qualified to be mayor? Oh please. Do you think 12:51 might be a campaign manager for one of those two "qualified candidates"? Look on the bright side. If Wooten stole the $ 6.4 million over the last 6 years, that's only about a cool million $$ a year stolen during Tornek's & Robinson's (lack of) oversight. Mayor Bogaard is among the lamest of the lame ducks. Someone has to be held accountable and Michael Beck has to go. Try the lottery 1:01. The odds are better. Didn't the Tattler say Michael Beck was going to be fired this week? Bad sources? It is true, I did. In a logical world that seemed obvious. Then I went to Monday night's Kabuki Theater show at Pasadena City Hall and began to think that the fix in. Let me ask you a question. If Beck is going to be fired, which elected giant is going to make that happen? Anyone taking the lead today? So there were no "sources" and you made it up. I see. I think a lot of people were playing hunches. Did you know that there was one fellow running around saying Terry Tornek is actually the guy that uncovered the embezzlement? This after 6 years of sitting on the committee that oversaw Wooten's little operation? People haven't stopped laughing about that one yet. Tornek won't call for Beck's firing. As a friend of mine says, maybe Tornek's missing something in his underwear. Mayor Bogaard is keeping them on ice in a fridge down at the city morgue. About time it's dingy and smells like grease and a nursery in there.Open it up let some air and light in don't push the stale coffee. I need an excuse to stop frequenting Starbucks. I love the casual comforts of Beantown, and the small town feel. I just wish they had good coffee. I am no expert, but I do appreciate good, fresh coffee. There is no comparison with what you can buy at Peets. The problem at Beantown is that they use very old beans. Whether they roast them there or not doesn't matter - the beans themselves are the problem. Can I have a raise, too? Crime??? Crime??? Those petty offenses are not crimes... the real crime is the nip nip nip of the SM Jackals that harass and intimidate good citizens that have paid their debt to society. Leave them be JACKALS!!!!! Shoot a burglar and get 6 months, but nip nip nip like the jackals you are and get city council seat. What is the real crime????????? Nip nip nip I'm thinking of starting a petition to request that the Tattler stop posting Mr/Ms Jackal. "Nip nip nip I'm thinking of starting a petition to request that the Tattler stop posting Mr/Ms Jackal." Silence yourself infidel!!!! Stopping free speech is how you jackals do it... all you let through are lies... nip nip nip the jackals will silence all voices of truth. Show yourself weasel instead of hiding as annonymous you jackal!!!! That is the real crime here is that the last sane man in SM will be silenced by the jackals!!!!! Leave me be!!! !